Knocked up and hittin’ the club! Bad mommy! Not the stork club, the night club! Going to a club to see a band tonight! So no booze, and I can sort of dress so my belly isn’t SO obvious. 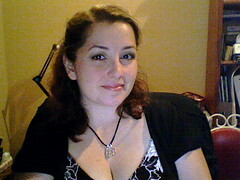 But still, slacker mom – heading to a bar/club on a Thursday night with friends to see my favorite cover band Lifespeed. I haven’t been out in FOREVER, and keep missing this band whenever they are playing anywhere near me. Memorial Day weekend they were playing in Long Beach Island the day we were down there, but I couldn’t very well blow off the family and hit the bar. It’s bad enough a lot of people at the club I’m going to are 21-30 — and I get looks ’cause I’m OLD (the day I get called a cougar is the day I stay in my house and never leave). And now I’m knocked up. AND I had to take my wedding rings off yesterday or risk them never coming off. GO ME!! Most of the gals at the bar have baby seats in their cars too, so I’m not so bad off. Right? Hell, I’m just SO glad to have a reason to wear makeup and heels for a night! What Does “Being a Successful Small Business” Mean to You? I love the blog! I’m so glad I found it on the Babyfit board.